Washer Faced Self Drilling screws with a hexagonal head. 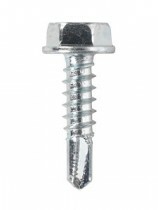 These screws are case hardened steel and zinc plated Cr3. Manufactured to DIN 7504 K.